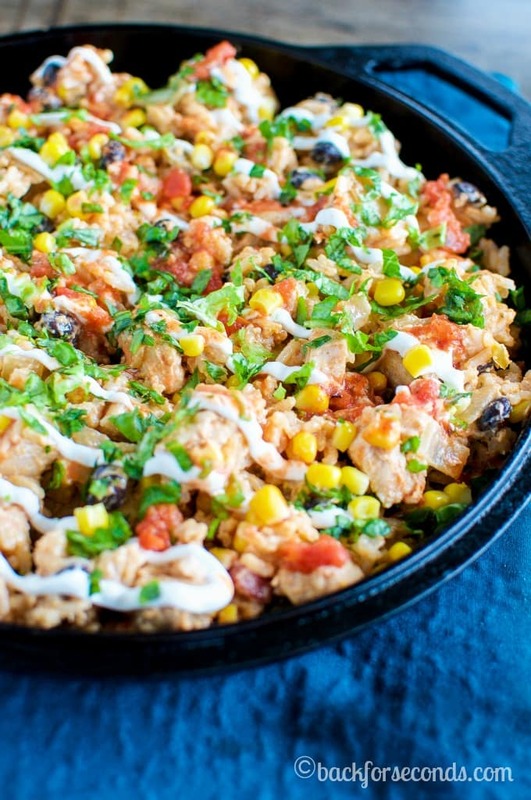 When you’re getting hungry and wondering what to make for dinner, try this 20 Minute Tex Mex Chicken Skillet! It’s a quick and easy dinner the whole family will love! I am becoming the queen of fast, easy dinners. Mostly because I am terrible at meal planning, so when my kids start telling me how starving they are at 5:oo every night, I panic and raid the pantry and fridge for anything I can cook up in a hurry. Last week when this happened, I was happy to find salsa, corn, rice, and black beans in the pantry, and I had chicken in the fridge. I knew immediately what to make! As the chicken was cooking I had the (amazing) idea to add cream cheese to the skillet. That is exactly what this dish needed to take it from yummy to “Mommy, can I have more?” and “This is the best food everrrr!”. Next time I will add a little lime juice over the top for a little zest! This is a new family favorite! I am always looking for quick meals. This is great! Your scenario (minus kids) is my reality! I wait until I starve, then raid the fridge and quickly throw something together haha! 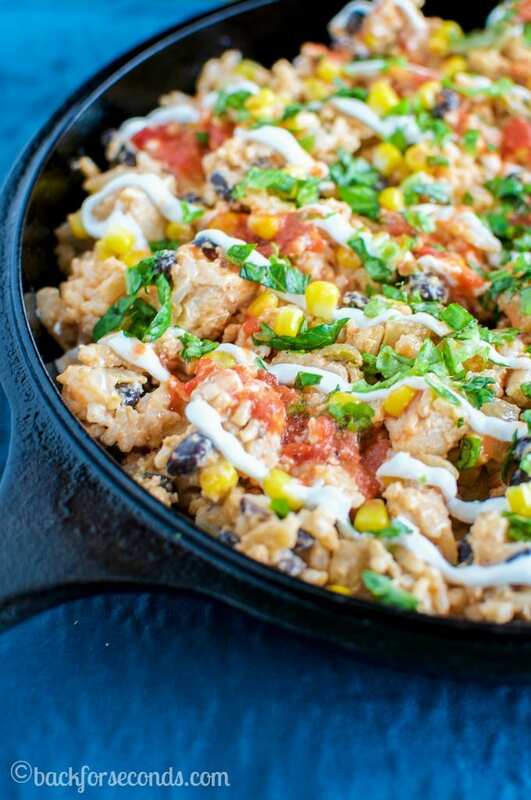 A 20 minute dish sound just perfect — this tex mex chicken skillet is a dream!! Oh my gosh Stephanie, this looks absolutely amazing. Good call on the cream cheese. I love when the kids ask for more and the recipe is a hit. It’s such a good feeling. 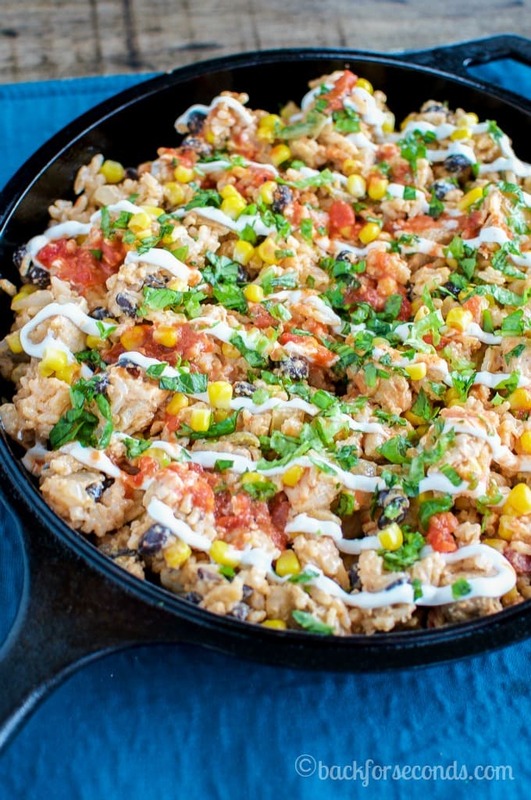 What a tasty looking skillet dinner! And so fast too! I’m loving the look of this skillet! This baby is packed full of flavor!